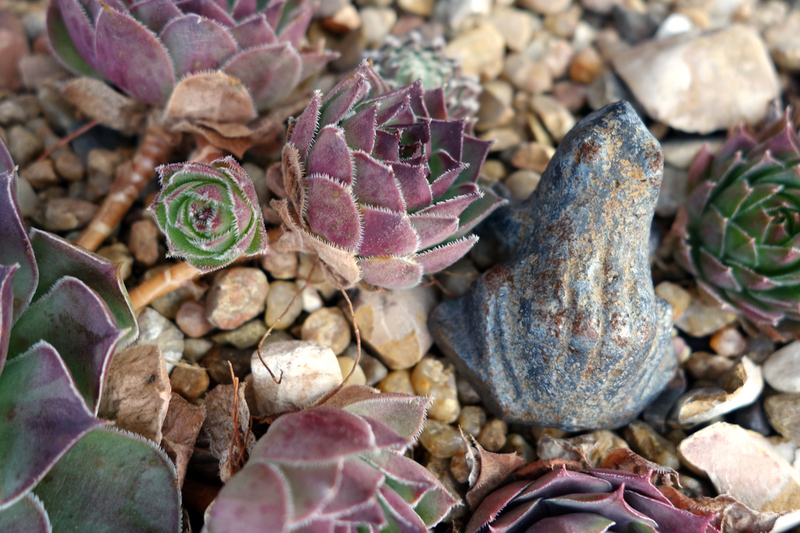 Sempervivums and sedums can be quite cold tolerant. Both my sempervivum collection and my Sedum dasyphyllum 'Major' are spending almost every day outdoors. The sempervivum winter coloration is especially compelling; the Sedum dasyphyllum 'Major' is a more attractive plant in its fresh juvenile form but it has an oddly compelling noodle-like appearance as it ages and winterizes. Did you know that most aphids are born pregnant? I was thinking about this odd fact since my sempervivum collection (colloquially known as Hen and Chicks) had an aphid infestation due in part to the unusually wet late spring here in Kansas. Luckily, neem oil has so far discouraged the little ladies from successfully hatching their next two generations. Below is a close-up of one the several sempervivum species I'm keeping in a rail planter on my porch.